What Do We Know For Sure About Hunting Deer Trails? The one thing we know for sure is that a deer trail is a place where deer have traveled. The fresher the sign in the trail the more recent it has been used. The more deer sign in the trail the more often it is being used. That all seems simple doesn't it? Well it is simple, yet even knowing all those things will not gaurantee success while hunting deer trails. You may have found a nice deer trial that looked like there was a lot of activity and set up over it only to go days and weeks without seeing a deer. In my experience, the the number one mistake hunters make is their setup. A hunter finds a well used trail and wastes no time throwing up a stand somewhere on the trail thinking... "It doesn't matter where I set up the trail is so heavily used that it won't be long before a deer passes my stand." Nothing could be further from the truth. Where and how you setup to hunt a deer trail is crucial to seeing deer and successfully harvesting a whitetail. One wrong move could mean pushing the deer out of that area for good. Or, at the very least, force you to leave and give the area time to "cool down". Either way you miss an opportunity for a chance at killing a deer. Getting set up weeks before you will be hunting a particlular travel area is a smart way to get a jump on hunting well traveled whitetail deer trails. Getting all the commotion over with long before you plan to to hunt a spot gives the spot time to "cool down" and gets deer back to that safe feeling. It also lets them get use to something new that has appeared in their woods. For blind hunters this can be especially true. Even the best camo blind can stick out in the middle of the woods to a deer that knows every inch of his surroundings. Giving the deer time to acclimate to something strange can do wonders when it comes time to hunt from that blind. It will take a lot of restraint to resist the temptation to hunt over the heaviest traveled part of the trail. This may be a hub where other trails converge on to a main trail. The reason it is so heavily traveled is because deer find this spot to be a safe haven. It may be a thick brushy area where they feel like they can't be seen or a wide open woods where they can easily see the approach of predators. When deer feel safe they have the advantage. The safe spot allows them all the means to detect you before you detect them, making it a tough place to hunt without them knowing you're there. Hunting this area on its perimeter is a better choice than setting up in the middle of all the activity. Catching deer approaching the hub before they have a chance to gain the advantage. By now you should already know that the greatest obsticle to harvesting a good buck is beating his nose. Avoiding being scented by deer is paramount when hunting any deer... let alone the big boys. Entering and exiting any trail area should always be done with the wind in your favor. It may also be necessary to set up more than one stand or blind area in order to change your location based on wind direction for that hunt. I know this sounds like an "I already know that!" statement. Most hunters do know the statement, but don't quite understand what it really means when it come to hunting high traffic trails. In this area deer are always on high alert because the area affords them all things necessary to detect predators. Limiting movement to approaching and leaving your stand area is best here. Putting up your stand or blind as quietly and quickly as possible will lessen the chances of deer knowing you are in the area. Even the most minute sounds can be unnatural in the woods and be like an alarm siren to any deer in hearing range. Try to spend as much time in the stand that day as you can. Going back and forth to the stand multiple time during the day will eventually attract attention and ruin an otherwise good spot. Try not to leave your spot until you are quite sure that there are no deer to see or hear you leave. Entering and exiting these hot spots are best done during the cover of darkness. The first thing hunters usually do when they find a deer trail is to start walking along the trail looking for more deer sign or trying to see where the trail leads. Every step you take reduces your chance of ever seeing a deer on that trail. Man tends to leave behind all kinds of clues that they have been in the woods. Touching, kicking, scuffing their way along a deer trial is like spreading red paint around a white room... it's hard not to notice someone was there. Just one footprint can be all that a deer needs to know that he doesn't want to frequent that trail anymore for his safety.Try to avoid walking directly on a trail that you are going to hunt. This especially applies to stand hunting. The Sun has a way of reflecting light off shiny objects like broadheads, gunbarrels, even eye glasses and the glass on your watch. A deer can easily pick up the glint from those reflections sending them scurring from the area. Like you, deer have a hard time seeing into the sun. Having the sun at your back sometimes is as good as any $300 camo outfit. You just have to be careful that the sun isn't positioned in a place where it shows your unnatural silhouette among all the natural leaves and branches of the tree you're in. Picking a wide enough tree or some other way to break up that silhouette will help you be less visible. These tips are guidelines to helping you overcome a deers natural ability to detect you when you are hunting heavily used deer trails. There are no gaurantees, but that doesn't mean we can't find ways to even the playing field a little. Next time you find a deer trail try to look at it from a whitetails perspective. 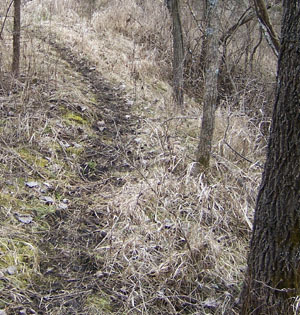 Anticipating how deer might use that trail can be a plus when deciding your approach to how you will hunt it.